20-04 | The history of MR imaging | MRI NMR Magnetic Resonance • Essentials, introduction, basic principles, facts, history | The primer of EMRF/TRTF. In radiology, the times of conventional imaging ended in September 1971 when the world's first axial x-ray computer assisted tomograph (CT or CAT) was in­stal­led in England. On 2 September 1971, Paul C. Lauterbur, a professor of che­mis­try at the State University of New York at Stony Brook (Figure 20-19), wrote down and had certified the idea of applying magnetic field gradients in all three di­men­sions to create NMR images (Figure 20-20). Figure 20-19: Paul C. Lauterbur (1929-2007). Already in the 1950s and 1960s Lauterbur had established his fame in the com­mu­ni­ty of nuclear magnetic resonance scientists by showing carbon and si­li­con spec­tra which led to many pub­li­ca­tions on various classes of organic che­mi­cals [⇒ Lau­ter­bur 1957]. However, all experiments before Lauterbur's invention of 1971 had been one-dimensional and lacked spatial information. Nobody could determine ex­act­ly where the NMR sig­nal originated within the sample. Lau­ter­bur's idea chan­ged this. Lauterbur called his imaging me­thod zeugmatography, combining the Greek words "zeugma" (ζεῦγμα = the bridge or the yoke that holds two horses together in front of a car­ri­a­ge) and "graphein" (γράφειν = to write, to depict) to describe the join­ing of chemical and spatial in­for­ma­tion. This term was later re­pla­ced by (N)MR imaging or MRI. 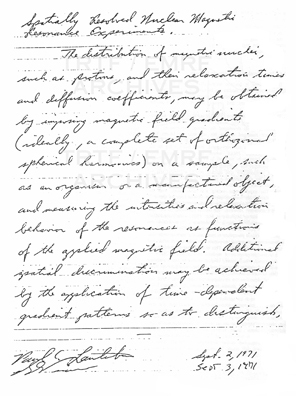 First page of Lauterbur's laboratory note­book describing his idea of "Spatially re­solv­ed nuclear magnetic resonance ex­pe­ri­ments," signed and witnessed in early Sep­tem­ber 1971. He published the first images of two tubes of water in March 1973 in Na­tu­re [⇒ Lauterbur 1973] (Figure 20- 21). Later in the year the pic­tu­re of a living animal, a clam, fol­low­ed and in 1974 the image of the tho­ra­cic cavity of a mouse [⇒ Lauterbur 1974]. 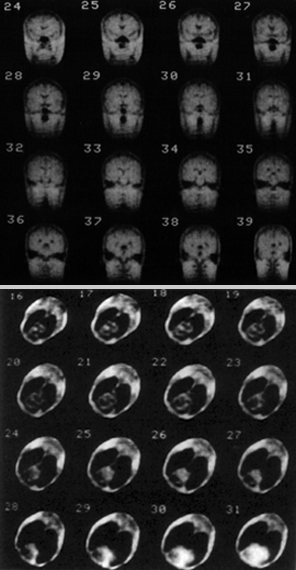 Lauterbur’s first published MR images ac­quir­ed at the State University of New York at Stony Brook (from Nature 1973; 242: 190- 191; reprinted with permission). Field gradients had been used before, though only in one dimension and with­out imaging in the mind of the researchers. They are an essential feature of the study of molecular diffusion in liquids by the spin-echo method developed by Erwin L. Hahn in 1950 [⇒ Hahn]; his group used a gradient approach also to cre­ate a storage memory [⇒ Anderson]. In 1951, Roger Gabillard from Lille in France had imposed one-dimensional gradients on samples [⇒ Gabillard 1951; 1952]. Carr and Purcell de­scrib­ed the use of gradients in the determination of diffusion in 1954 [⇒ Carr HY 1954]. Many of today's innovations were thought of and developed in Lauterbur's la­bo­ra­to­ry in the late 1970s and 1980s, from radio-frequency coil design, mag­ne­ti­za­tion transfer, 3D- as well as chemical shift imaging, oblique and curved slice re­con­struc­tions, flow imaging, heart and lung imaging, using elements different from hy­dro­gen, to NMR microscopy and contrast agents [⇒ Bernardo; ⇒ Frank; ⇒ Lai; ⇒ Lauterbur 1974; 1975; 1976; 1977; 1978; ⇒ Muller; ⇒ Rinck 1984; ⇒ Simon]. Some ex­amp­les are shown in Figure 20-22. 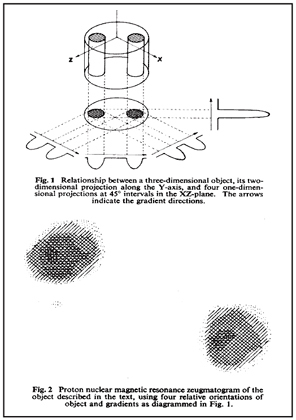 Most images in Lauterbur's laboratory were acquired in three dimensions. Top: coronal images from a 3D human brain study. Bottom: transverse images from a 3D study of a dog's heart, synchronized with the ECG, 400 ms after the R-wave. These images were made in 1982. 3D- imaging with commercial systems became only possible some 10 years later. Chapter 20 | The history of MR imaging – Page 4  Go to Chapter 20, page 1, 2, 3, 4, 5, 6, 7, 8, 9, 10.